A new bathroom can give your property a sense of replenishment and improves your quality of life. Why Add A New Bathroom? A new bathroom can dramatically improve the appearance of your home, as well as make life easier for you and your family. I’m sure we have all endured the struggle of fighting over the bathroom as everyone races to get ready for work and school in the morning. Although an additional bathroom may not seem like it would make a significant difference to your home, it can affect and improve it in a number of ways. How many times have you been bursting for the toilet after one of your family members has taken up the entire bathroom for the past 3 hours? It’s time to eliminate that issue and discover the benefits that adding an extra bathroom to your property could bring to you. So keep reading! Often homeowners leave the unutilised space in their home without use; this is a big mistake as you could use this space to make your home more efficient and improve your quality of living. 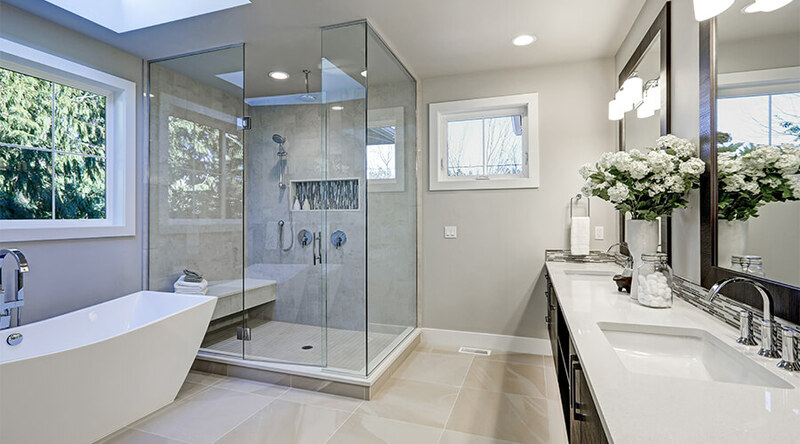 Some people, unfortunately, do not have the extra space for an added bathroom and often have to seek the help of home extensions Buckingham to add another bathroom. But if you already have the space and it’s not being put to use, why not transform it into your ideal bathroom? One of the best things about having a new bathroom is that you can design it exactly to your preferences to suit your best uses. For example, if you’re somebody who regular pampers themselves with bubble baths or loves home treatments and beauty remedies. Create your own spa-inspired bathroom with a big free standing bath, or plenty of storage for all of your treatments and products. This is the most common reason that homeowners invest in an added bathroom, as they feel like they aren’t making the most out of their home’s potential by leaving unused space! It can be hard to have an efficient property with enough space if there are 5 people attempting to use the bathroom every morning and throughout the day. Your bathroom is going to be constantly in use and be a struggle to get into. Adding a new bathroom eliminates this issue and allows the added space for family growth. If you have young adult children or teenagers, it can be nice to provide them with their own space to carry out their daily beauty regime or grooming routine. This also applies for yourself; if you live a busy day to day life, you may want to come home and relax and unwind in a soothing bubble bath or warm shower. With a full house who are all also eager to use the bathroom, this can be extremely difficult and can become a daily issue. Adding another bathroom breaks up the rush for the bathroom in the morning and takes away constant use from just one bathroom. Similar to what we previously mentioned, having an extra bathroom is just more convenient for yourself and your family. Often when people install new bathrooms into their properties, they add it to a floor that doesn’t already have any bathroom amenities. This is because if you are downstairs in your living room and watching TV, yet you have no bathroom downstairs, you would have to walk upstairs just to use the toilet. But for convenience, you could have a bathroom installed downstairs in order to make your life simpler for yourself. It also is more convenient for when you have guests round. If you are eating dinner in the dining room and they need the toilet, having a bathroom just down the hallway saves them the hassle of going upstairs, which they may not want to do anyways as it may feel like they are being intrusive. If you have guests over for the weekend, one of the most awkward situations for them is having to ask to use your shower or ask if they can use the toilet. To avoid this problem, you can add an extra bathroom if you have guests round regularly. It may not seem like a big issue, but it can help your guest settle in a lot easier, especially if they stay or come to visit often. If you are thinking about adding a new bathroom to suit guests, take a look at this article on how to prepare your home for guests. Another popular reason that homeowners add an extra bathroom. Privacy is vital in your property, especially if you are living with other family members or friends. Everyone needs a little bit of time to themselves, and this can be hard to do when you live with other people or if you have children. A great way to spend some time to yourself is in your own bathroom, whether this is an added bathroom or an en-suite. You can relax in a shower or bath in peace, and can also make room for your personal belongings and products. A bathroom although it’s only a small and straightforward addition to your home, it can have a significant effect on the original price of your property. Adding a basic bathroom to your property can cost roughly around £5000, but adds around £2500 onto the price of your property, bring in a return on investment of around 50%. Making it a worthwhile addition, not only is it one of the most cost-effective home improvements, but it will most definitely give you a return on investment. Take a look at this article for how you can improve your property’s value. You can never have enough bathrooms in your property! Most new build homes Woburn Sands have more than one bathrooms, but if you live in a period home that doesn’t have more than one bathroom, it could be a good idea to invest in one to make your life easier.